Shaded relief art with rivers and water bodies added for reference. Using Photoshop with a Wacom tablet, and digital terrain data as a guide, I drew a generalized shaded relief of the 48 contiguous US states and adjacent countries. The relief art attempts to combine digital accuracy with manual style. My hand drawing focused on mountains, plateaus, canyons, and other prominent features. Very flat areas, such as Florida and Illinois, derive primarily from downsampled digital terrain data. 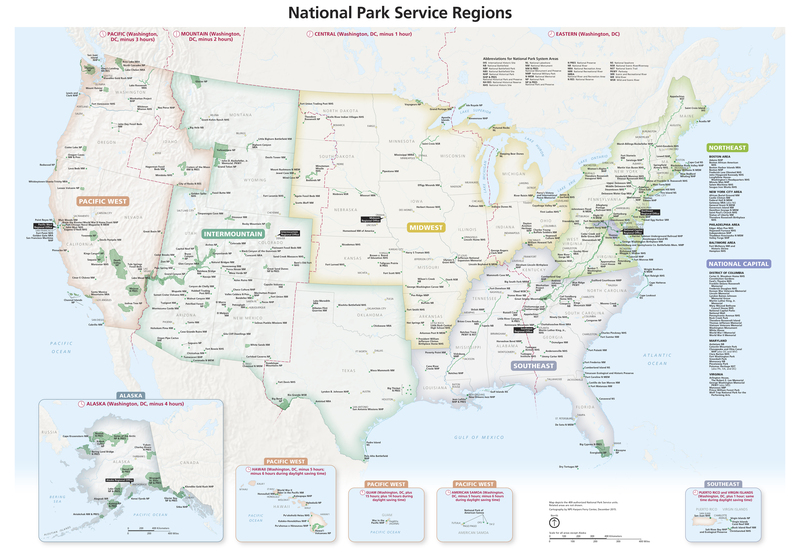 I created the relief to use as a soft backdrop on small-scale thematic and reference maps, such as this map of National Park Service Regions. It is a companion piece to the Manual Shaded Relief of the World released in early 2015. Go to the Natural Earth website. • The shaded relief is in the public domain. Feel free to use it however you wish. • It fits 1:10 million-scale Natural Earth coastlines, rivers, political boundaries, and spot elevations. • The grayscale GeoTIFF image has contrast ranging from 4 percent (highlights) to 20 percent (flat areas) to 50 percent (shadowed slopes), which you can easily adjust with image editing software. • The 350 DPI relief measures 35.94 x 27.13 inches (91.3 x 68.9 centimeters) and contains 12,578 x 9,494 pixels. You can enlarge or reduce it to use with a variety of maps—from web tiles to print publications to wall displays. 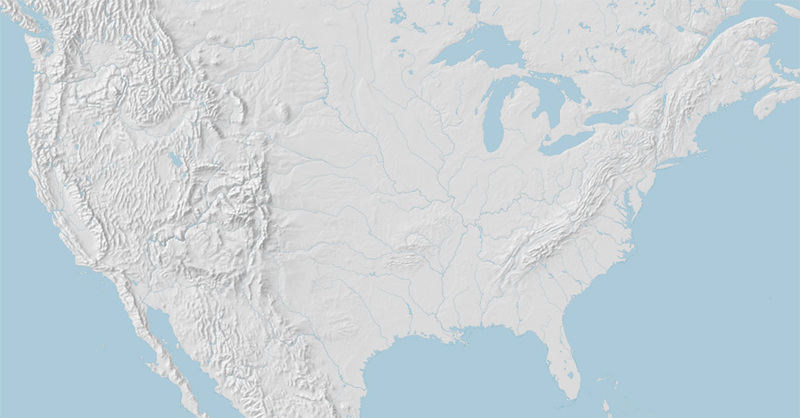 • The shaded relief is in the Web Mercator projection, WGS84 datum. Map reprojection: Northern areas become smaller when you transform the relief from the Web Mercator projection (left) to the Lambert Azimuthal Equal-Area projection (right) and other equal area projections. To compensate for this, I drew northern areas with slightly less relief detail. Light direction: Black arrows indicate standard northwest lighting, which worked well for drawing the perpendicularly aligned Appalachian Mountains (A). Red arrows show the lighting adjustments that I made to better depict terrain with different alignments. 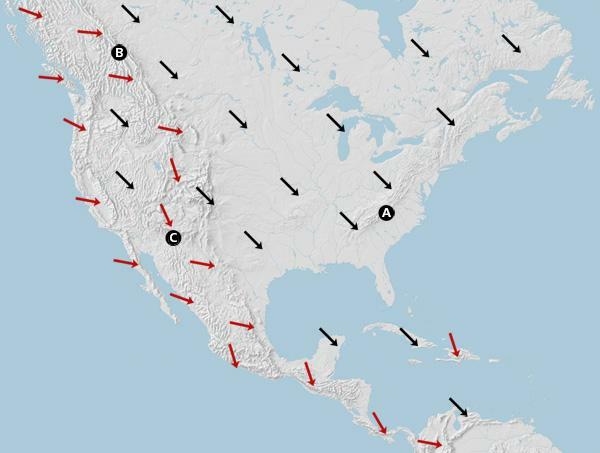 For example, the northwest trending Canadian Rockies (B) are easier to see with more westerly lighting. And the east-west Mogollon Rim (C) is better served with light shifted to the north. Generalization: I used digital shaded relief (left) derived from SRTM data as a reference for drawing the manual relief (right).